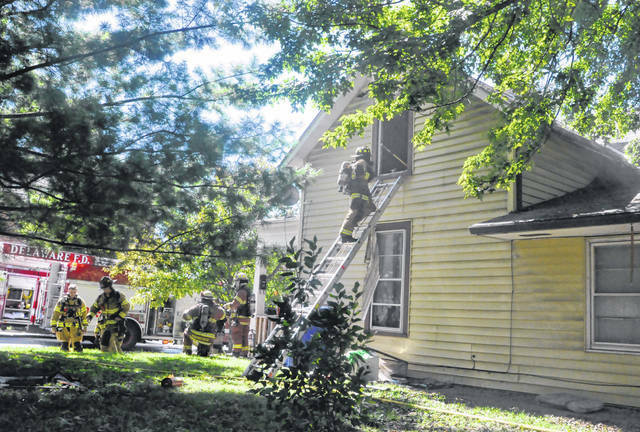 Pictured are local firefighters on the scene of a house fire on East Central Avenue in Delaware on Sept. 28. During Main Street Delaware’s First Friday event on Oct. 5, the community will have the opportunity to get an up-close look at the city’s rescue equipment and meet with members of the City of Delaware Fire Department. As the calendar turns to October and the fall season is officially welcomed, Main Street Delaware is preparing to host its next First Friday event, “Paws and Prevention,” in downtown Delaware. The October festivities will begin at 6 p.m. on Friday, Oct. 5, and will run until 9 p.m. Firefighters from the Delaware Fire Department will be on hand with fire trucks and various equipment for children to check out. They will also offer demonstrations with fire extinguishers and other lessons to promote safety in the community. In addition to promoting safety, this month’s First Friday will also promote plenty of cuteness as Main Street Delaware will host the seventh annual Pet Walk. Pet owners who want to participate in the stroll through downtown can purchase a ticket at $10 per pet. Tickets can be purchased at www.mainstreetdelaware.com or at the Main Street table, located near North Sandusky and East Winter Streets, during the event. However, while tickets are still available, only 100 tickets total will be sold to participate in the walk. Upon check-in, registered pet owners will receive a doggy bag and a map that will feature various pet-friendly locations in the area where pets can stop by to receive a treat to add to their bag. Prior to the walk, pets will be photographed to be included in an album on Main Street’s Facebook page. The pet receiving the most “likes” will be named the “Furry Marshall” for Main Street’s Dec. 1 Christmas parade. Delaware County District Library will also be awarding the best pet costume as part of its upcoming third annual Great GeekFest comic-con, which will be held on Saturday, Oct. 20, at the main library. Free pumpkins, courtesy of Mad Max Farms, will be handed out while supplies last, and the President Hayes Memorial Committee will also be making short presentations throughout the night at Sandusky and William streets. Main Street Delaware Executive Director Susie Bibler said she always looks to keep the different First Friday events fresh, but this particular one, which she said is one of the most popular events every year, was an easy event to keep doing. The celebration is sponsored by Performance Chrysler Jeep Dodge Ram of Delaware and the Delaware County District Library. For more details and information on First Friday and other upcoming Main Street Delaware events, or to purchase tickets for the pet walk, visit www.mainstreetdelaware.com.